ONLY $8 per teacher or staff member! Click Here to Download Your Special Order Form Today! 5 Classic notepads of 50 sheets each! FREE 2 sets of 500 school business cards! FREE 2 sets of 10 school notepads! FREE Proof before printing upon request! With your order of at least 10 teacher business cards and notepads! Click on samples above for larger view. Personalized Business cards and Notepads are the perfect way to show your Teachers and Staff how much they are appreciated. At Amity Printing there is never a set-up charge and satisfaction is always guaranteed. In fact, we won't even bill you until you have received your order and you, and your teachers, are completely satisfied! Starting at only $8 per teacher, business cards and notepads connect teachers and staff with parents and colleagues throughout the year. Choose from 3 paper colors and 6 ink colors. There are also hundreds of mascots and school logos to choose from. We can also use your own school's artwork. 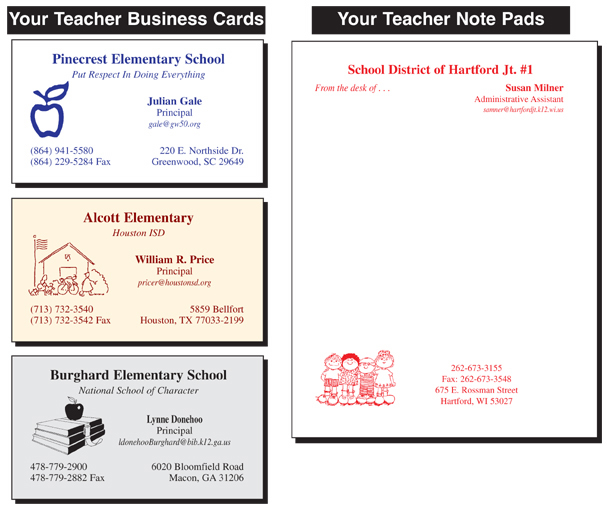 *With your school business card AND notepad order for at least 10 teachers or staff members.